SHREE Shubhmangalam showroom located at Laxmi Bhavan Square, Dharampeth is celebrating its 5th anniversary. As an anniversary offer, the store has announced 20 per cent discount. The store houses sarees, ghagra, salwar suit and latest range of jewellery. Looking at the Navratri and the festive season ahead, the store has brought wide and exclusive latest range all offered with a discount of 20 per cent. The offer is getting overwhelming response from customers. Shree Shubhmangalam is witnessing huge footfalls of customers who are taking the benefit of the offer. Director of the showroom has requested to take the benefit of the offer which is for a limited period only. 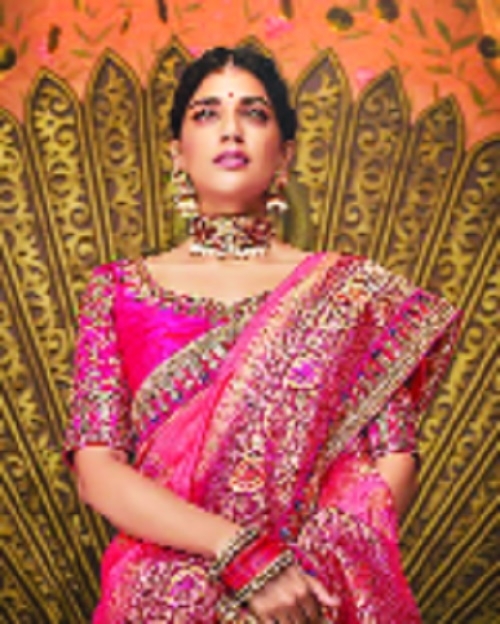 Sarees, jewellery, suits and ghagra’s latest range is included in flat 20 per cent discount. Shree Shubhmangalam not only offers fascinating range of sarees but also unique variety of designer ghagra. Apart from clothings new jewellery range is displayed at the showroom which enhances the beauty of the clothing. Looking at the good response for the wedding collection, the management has decided to keep the showroom open on Sundays too during the marriage season so that customers can select of their dress. The owners have requested people to visit the showroom and take the look of exclusive collection of ghagra, sarees, suits and jewellery. Shree Shubhmangalam is located at Laxmi Bhavan Square, Dharampeth. Since inception, Shree Shubhmangalam showroom is receiving overwhelming response from the customers.